Gone are the days where massages are only available in luxury spas, resorts, and in NFL locker rooms. Many people are realizing the benefits of massage therapy for not only athletes, but for everyone! 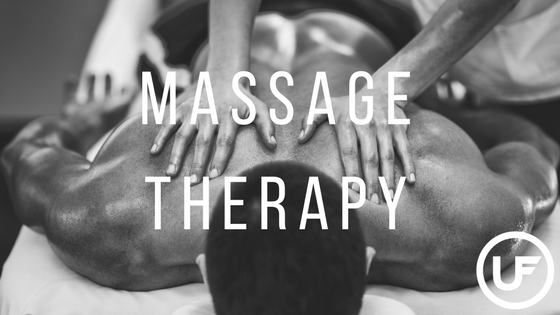 According to the American Massage Therapy Association (AMTA), massage acts to improve performance, reduce pain, prevent injury, encourage focus, and shorten recovery time. In a 2016 AMTA consumer survey, 78% of individuals surveyed claimed their primary reason for receiving a massage in the previous 12 months was medical (50%) or stress (28%) related. Perceptions on the reasons for massages are also changing. 71% of consumers agree that massage therapy should be considered a form of healthcare, not just a pampering perk for the rich and famous. Sore from one of our classes? Good, you should be! Thanks to the benefits of massages on the muscular system, your body can actually recover faster. Massage affects the cardiovascular system by dilating blood vessels helping them work more efficiently to boost circulation, resulting in an increased flow of fresh oxygen and nutrients being delivered to your muscle tissue. This helps relieve tension and reduces soreness. Studies show that massages are an effective treatment for reducing stress. Massages reduce levels of the stress hormone cortisol, resulting in lower blood pressure. Regular massages can help you manage anxieties and stress allowing for relaxing me time. According to the annual stress survey commissioned by the American Psychological Association: 25% of Americans surveyed experience high levels of stress. 50% of Americans surveyed report moderate levels of stress. That means that 75% of the individuals surveyed are chronically stressed out! Insomnia knocking on your door? Believe it or not, massages can actually improve sleep. Studies have found a link between massages and healthy sleep. The common denominator? Delta waves. Delta waves are the brain waves connected to deep sleep. Massages increase delta waves, helping you to relax and fall asleep, without having to count sheep. Did you know that Union Fitness has a massage room with a trained professional on staff? Marco Rigazio MS, LMT has been in the health and fitness industry for over 30 years! Marco has a Master’s degree in Exercise Science from California University and is a licensed massage therapist with a special interest in neuromuscular therapy, deep tissue, and Swedish massage. Working with chiropractors and physical therapists, corrective exercise and tissue therapy has been a mainstay for the last 6 years. Give us a call or send us an email to schedule a massage with Marco!